The event will take place at Dubai World Trade Centre (DWTC) from October 29 to 31. 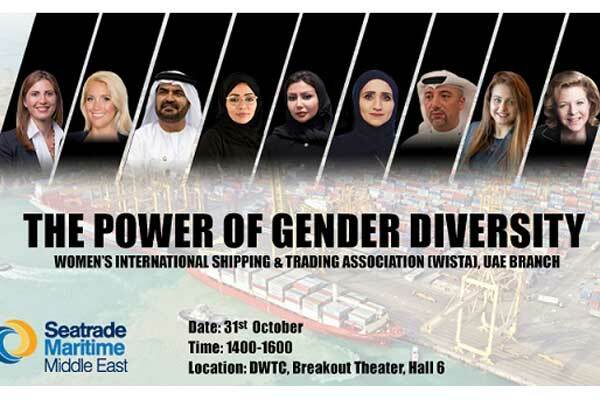 Endorsed by HRH Princess Sarah Al Saud, Women’s International Shipping and Trading Association (WISTA) UAE’s Ambassador, the session on day three of the global shipping event will examine whether the shipping industry is still reluctant to give jobs to women in what has largely been a male-dominated industry. It will also discuss ways to empower women in the maritime sector, amongst other topics, said a statement. Several high-profile speakers have committed their time to this important session. This include Hessa Bint Ahmad Al Malik, executive director of Maritime Transport Sector, Federal Transport Authority for Land and Maritime(FTA); Julian Abril Garcia, head facilitation, Subdivision for Maritime Security and Facilitation, International Maritime Organization; Dr Noura Al Dhaheri, chief executive officer, Maqta Gateway, Abu Dhabi Ports; Mohammed Al Muallem, chief executive officer and managing director UAE Region, DP World; Ali Shehab Ahmad, deputy chief executive officer, Kuwait Oil Tanker Company (KOTC); Ksenia Zudinova, director of Emirates Zone; Jasamin Fichte, managing partner at Fichte & Co and president of WISTA, UAE; and Effat Mostafa, managing partner, Tactics Maritime Media & Marasi News. The session will be moderated by Eithne Treanor, founder and managing director, E Treanor Media. Keeping on the topical theme, some of the issues now facing international shipping are highly complex, generating widely differing views from across the industry. To address one such pertinent issue, Smart Shipping, a Seatrade Parliamentary Debate will take place, sponsored by ABS. Speakers for and against a motion will be invited to put forward their opinions, before opening up the debate to all participants. The debate concludes with a vote by all attendees, and the motion will either be carried (ie. the majority will agree that the industry is not ready for smart shipping) or defeated (the majority will agree that it is ready for smart shipping). Speakers for the motion include Khalid Hashim, managing director, Precious Shipping; Ali Shehab Ahmad, deputy chief executive officer, Kuwait Oil Tanker Company (KOTC) and Captain David Stockley, chief operating officer, Oman Shipping Company. Speakers against the motion include Rene Kofod-Olsen, chief executive officer, Topaz Energy Marine; Oskar Levander, senior vice president, Concepts & Innovation, Rolls-Royce Marine and Drew Brandy, senior vice president Maritime Market Strategy, Inmarsat. In association with DP World, digitalisation will be discussed. Prominent players in the region’s maritime and logistics sector will join technology innovators in debating the industry’s pathway towards digitalisation, and what the new revolutionary technologies may mean for the future. Addressing key questions, the discussion will include the speakers: Julian Abril, head of facilitation, subdivision for Maritime Security and Facilitation International Maritime Organization; Dr Noura Al Dhaheri, chief executive officer, Maqta Gateway, Abu Dhabi Ports; Abdulla Bin Damithan, chief commercial officer, UAE Region, DP World; Howard Fireman, senior vice president and chief digital officer ABS; Peter McLean, senior vice president, Kalmar Asia Pacific; and Pieter Zylstra, regional director, digital transformation, MEA Orange Business Services.